NAPCAN is happy to announce the release of the 2015 National Child Protection Week (6 to 12 September) posters, which can be downloaded. Be someone who listens to children is the core message of this year’s National Child Protection week poster. The Protecting Children is Everyone’s Business poster, designed to be displayed year round, demonstrates that to prevent child abuse and neglect we can all play a part. Parents, an aunt/uncle, friends, health practitioner and local business are featured with advice on how to offer support to children and families, such as for local businesses to ‘promote a family friendly environment’ and that it’s OK for parents to ‘reach out, ask for support and take time out’. To receive a copy of both posters please email: [email protected] with the subject “NCPW 2015 poster request” and include the mailing address. If you would like more than one copy of each poster, (the cost is free) please email: Madelene McGrath ([email protected]) with the subject “Bulk Order 2015 NCPW Posters”. Make sure to include how many posters you would like and the mailing address. 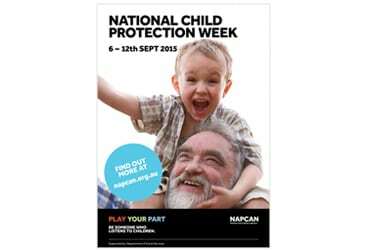 Please spread the word about National Child Protection Week, for more information: http://napcan.org.au/ncpw/.